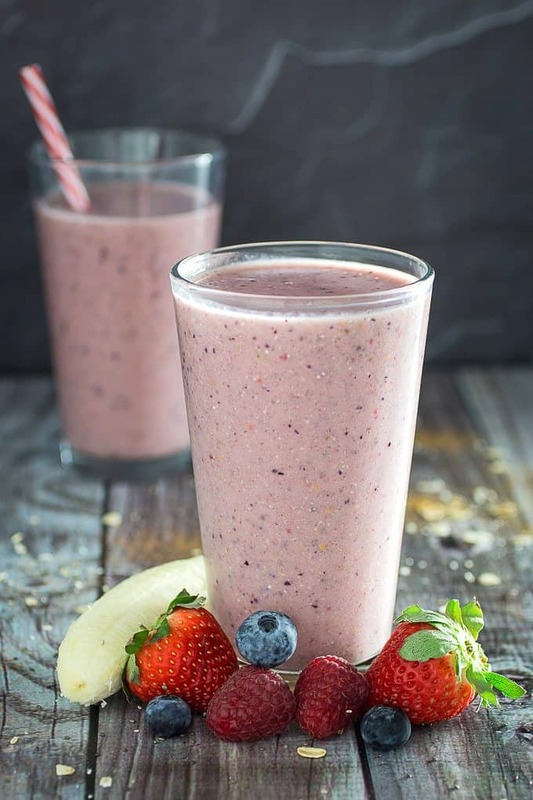 Strawberry Banana Chia Seed Smoothie is a quick and easy smoothie you can enjoy any time of the day. Nutritious blueberries, strawberries, and banana, perfectly combine with oatmeal, chia seeds, and a touch of cinnamon and honey. It’s perfect for breakfast, or a mid-afternoon snack! Here’s a great recipe if you’re looking for something quick, healthy, and tasty! 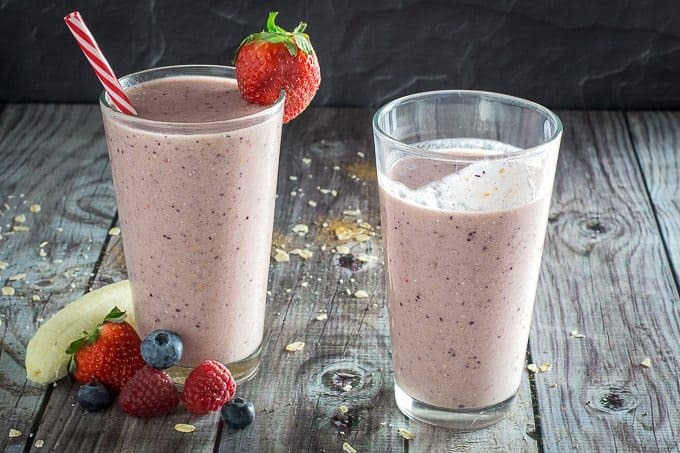 It’s full of sweet fruit like bananas, strawberries, raspberries, and blueberries. Then, you have oatmeal to keep you full after breakfast, and chia seeds! 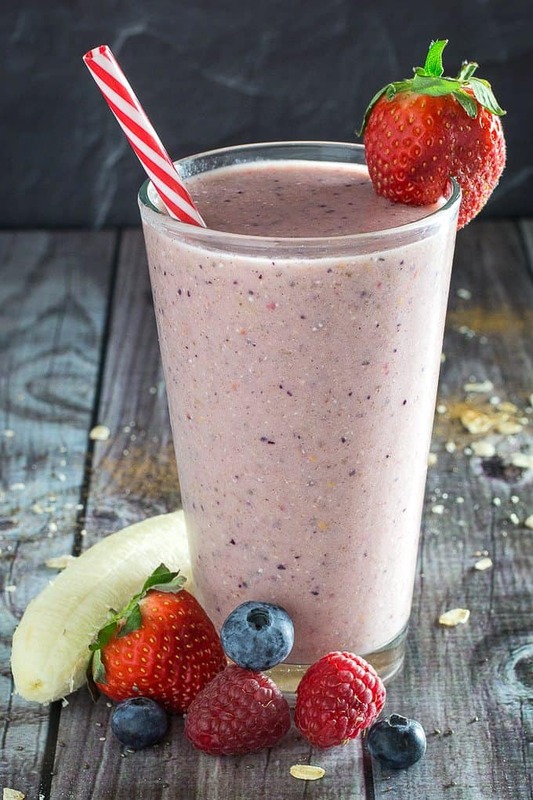 This strawberry banana chia seed smoothie also uses almond milk, making this smoothie dairy free and vegan (if you consider honey vegan). It pretty much has something for everybody! In my house, you can never have enough smoothie recipes. Andrew and I are blending up something at least once a day. Either I’m taking something with me as I’m running out the door on the way to work, or Andrew is making one while we wait for dinner to finish cooking. They’re quick, they’re easy, and they’re tasty. Does it get any better than that? Furthermore, they make healthy eating really easy. If you had a chance to check out my Green Monster Smoothie, I talked about how I’m working on eating healthier now. I’m officially in phase 3 of Jamie Eason’s Livefit Trainer, and carefully counting my calories every day. And I’m officially one size down! Hooray! Also, I’m really, really sore. Like, all the time. But it’s definitely worth it, because I’m seeing awesome results, building muscle definition, and I feel amazing. Maybe one day I’ll be brave enough to share a before and after photo with all of you. Maybe, if I can work up the nerve! And recipes like this really help keep me going during a busy day. My schedule is basically going to work for the day, then to the gym for about 2 hours, then home to meal prep and blog until it’s time for bed. Unless it’s leg day, because I don’t do cardio on those days. Who would have ever thought that leg day would feel like a rest day? So, having something that’s quick and easy is really a priority in my life. Which is why I love smoothies so much! And just in case you do, too, I’ve made a quick list to give you some inspiration this week. 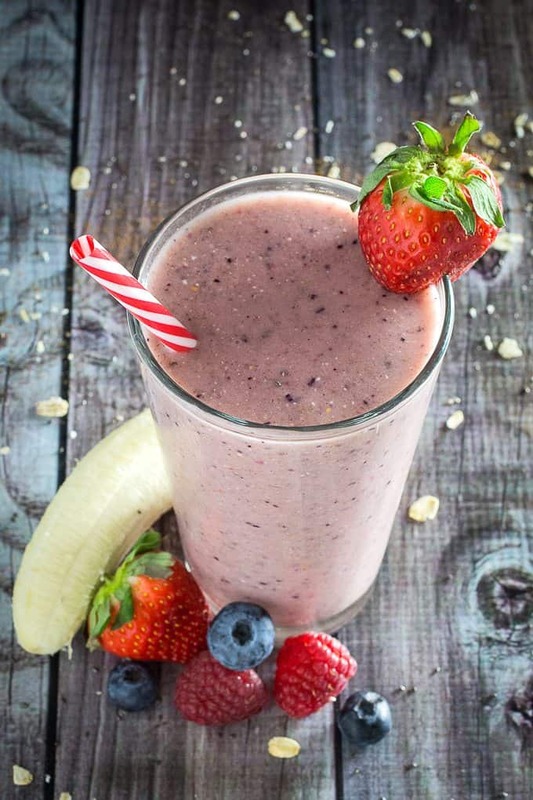 If you love this strawberry banana chia seed smoothie, you’ll also love these! 1.) Breakfast Pumpkin Pie Smoothie – Here’s a great smoothie that tastes just like pumpkin pie! But it’s actually full of pumpkin, which definitely counts as a vegetable. Shhh… don’t tell anyone! 2.) Green Monster Smoothie – This one is basically the perfect green smoothie. It has the nutrition of spinach, with the flavor of oatmeal and creamy peanut butter. I know, I know, it sounds a little bit weird. But it’s really good, I promise! 3.) Chocolate Chip Mocha Breakfast Smoothie – This one is for all of the coffee lovers out there. It’s kind of like a frappuccino and a smoothie ran into each other and had a super delicious breakfast smoothie. 4.) Chocolate Peanut Butter Protein Shake – Ok, so this one technically isn’t a “smoothie” per se, but that’s just because I felt like naming it after the protein in the recipe. This is probably my top favorite out of all of the smoothies on this list. It’s higher in calories, which makes it perfect for days when you have a really hard workout, or you’re super busy and just need to get more calories in. Or, you just feel like indulging! 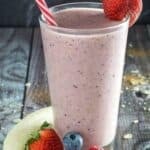 Strawberry Banana Chia Seed Smoothie is a quick and easy smoothie you can enjoy any time of the day. Nutritious blueberries, strawberries, and banana, perfectly combine with oatmeal, chia seeds, and a touch of cinnamon and honey. It's perfect for breakfast, or a mid-afternoon snack! Place all ingredients into a blender and blend until liquified. Serve. You can use regular milk in this, too! Simple Avocado Egg Salad Recipe - Gluten Free! Previous Post: « Lemon Brownies & Lemon Glaze – Gluten Free! That looks so good and feels so healthy. Great way to start a busy day, Shhh… don’t tell anyone! Lol.